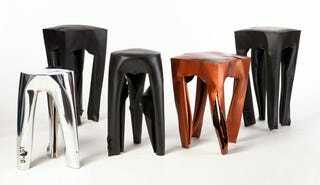 These stools, called Blast Stools by Guy Mishaly, look like scrunched up wads of paper. Why is that? Because the stools take their odd and wrinkled shape from being blasted with explosives. That's right, they're made with explosives. Mishaly shapes a steel model (usually a cylinder or cube shape) and then straps some explosives to the model. When he detonates the charge, it "naturally" rips and shapes the legs and body, leaving a stool survivor with a unique shape. Supposedly, Mishaly sets the explosives in a way where no material is lost (just deformed). I don't know about you but I'd love to sit on a chair that survived an explosion.